Venison is probably not one of the most popular accompaniments for pasta or one of the most common ingredients in pasta dishes. 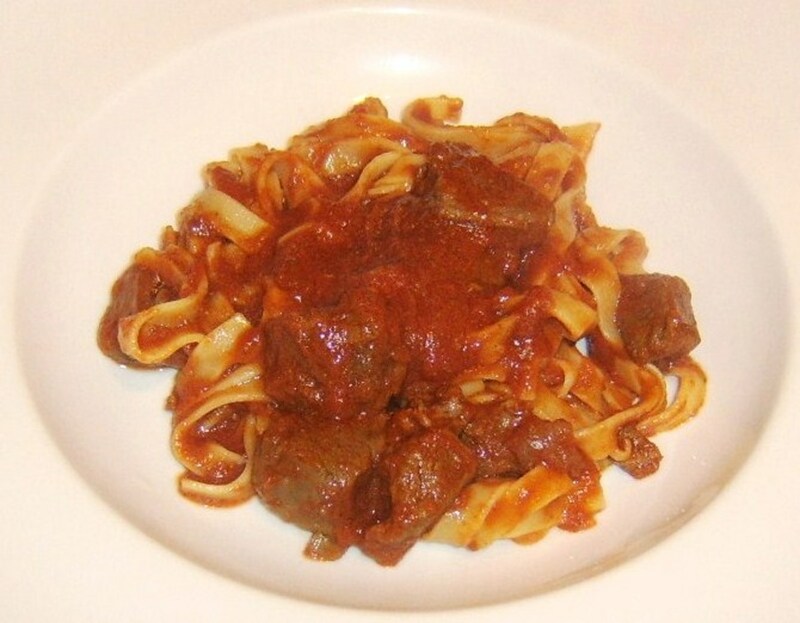 As the recipes on this page will hopefully prove, however, properly cooked and presented loin of venison works very well with pasta and a surprising variety of accompanying ingredients. 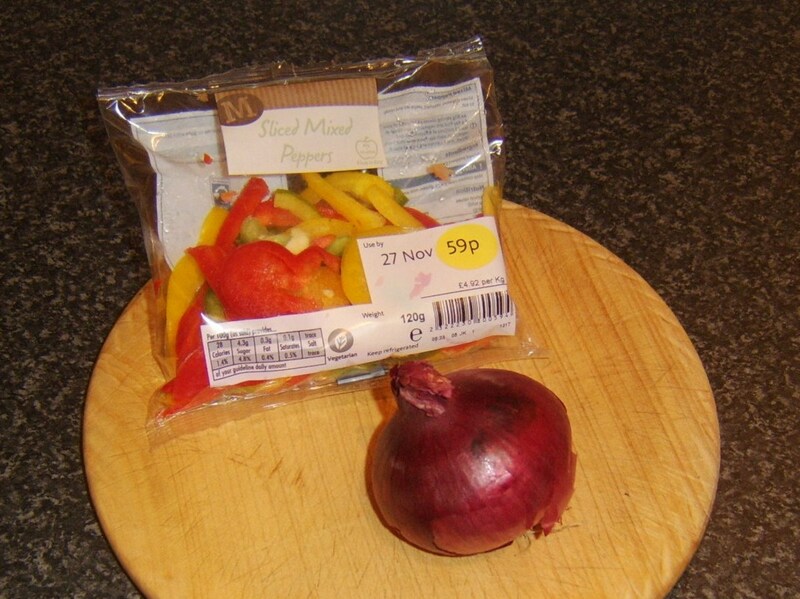 The various recipes are shown in full detail, incorporating step by step photographs as well as text. 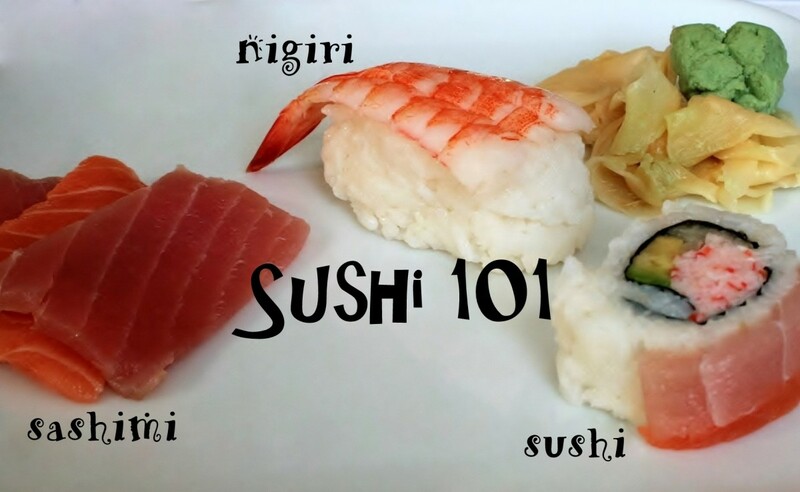 Hopefully, you will like some of these ideas enough to give them a try at home. 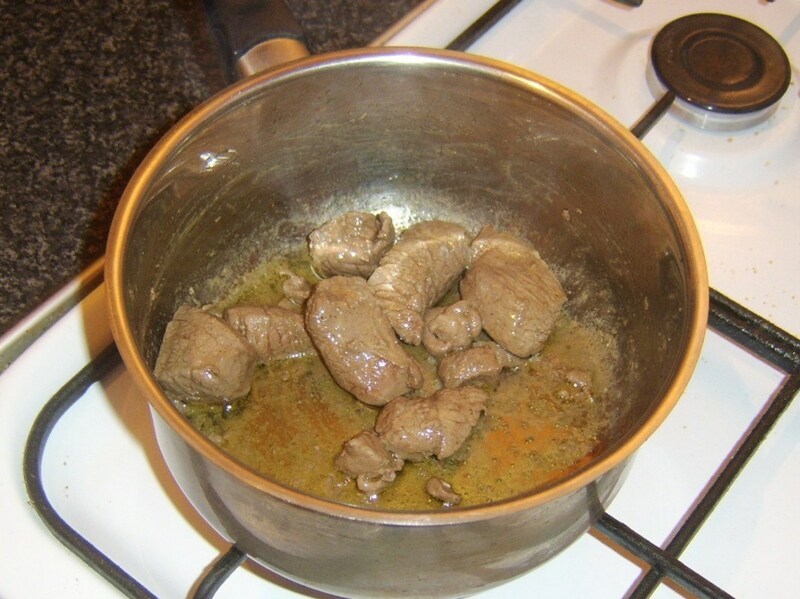 Note that although the lengthy cooking time required for the venison in these recipes is unfortunate, it really is necessary if the meat is to be enjoyed at its tender best. 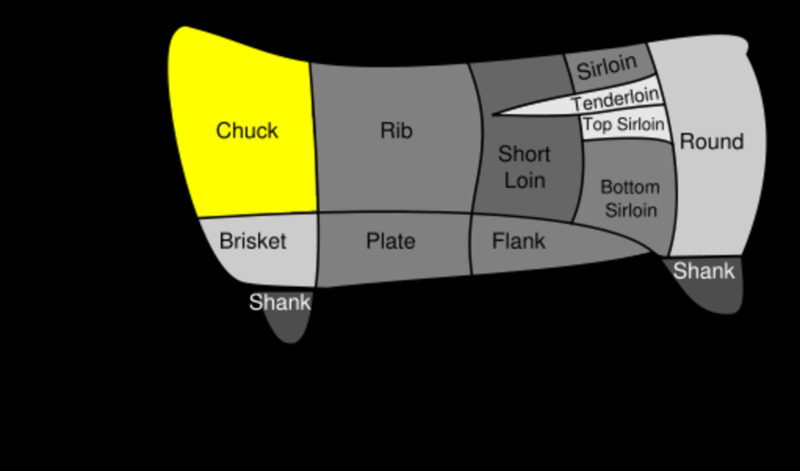 Venison is a word that can be made to apply to a wide variety of types of meat around the world. 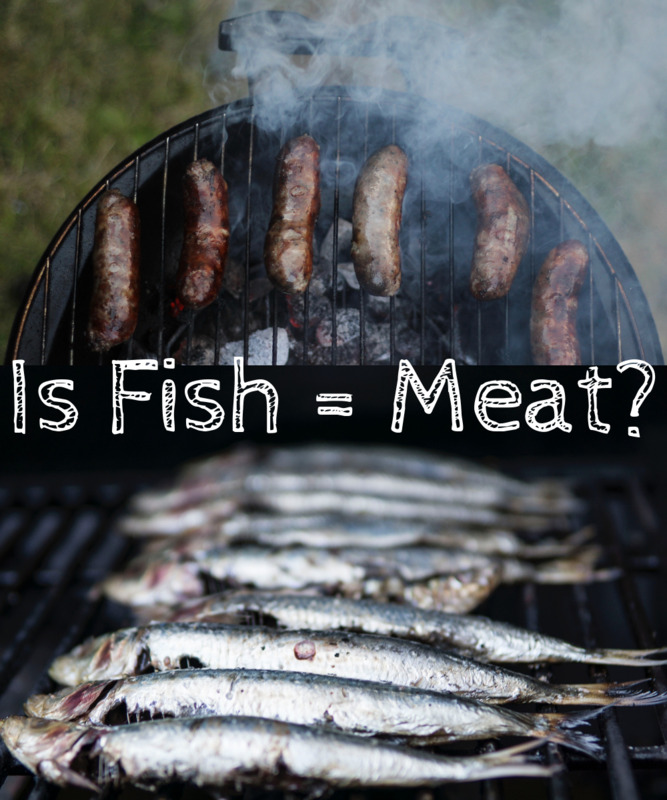 Originally, it was made to apply to any type of wild game but in more modern times, it is generally applied only to meat from members of the wider deer family. 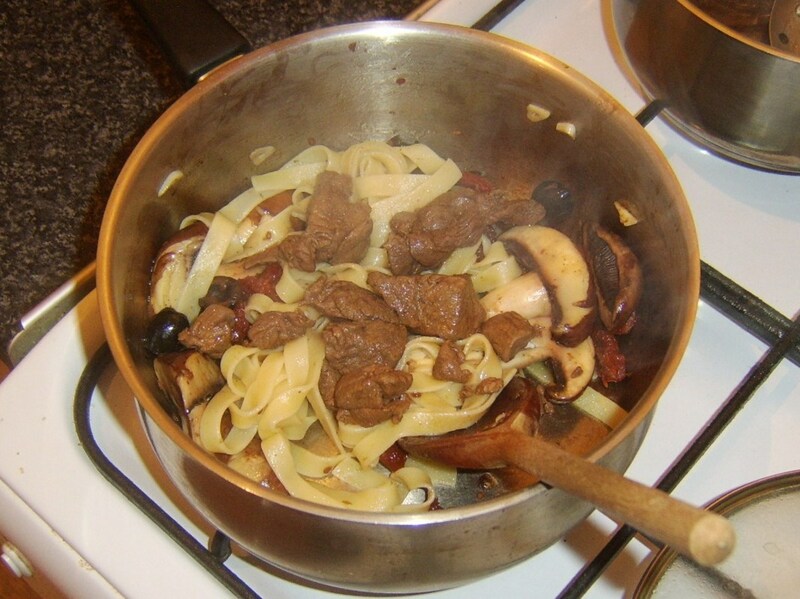 The venison used in the recipes featured on this page is loin meat from farmed Scottish red deer. 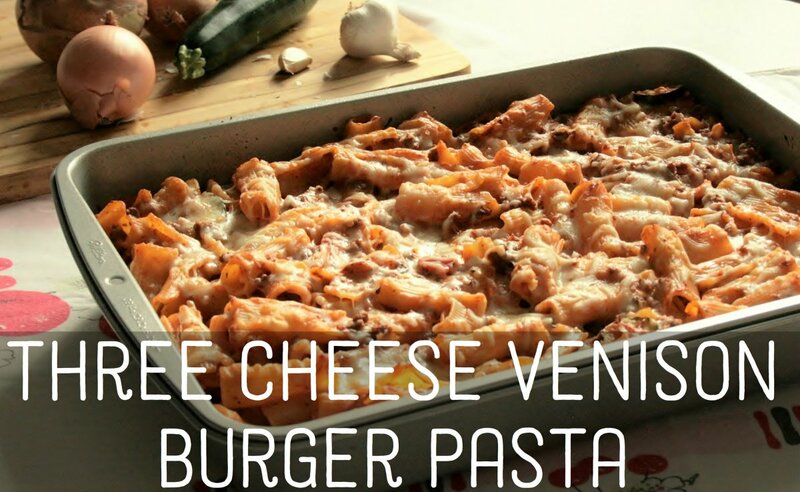 Cast your vote for this recipe. 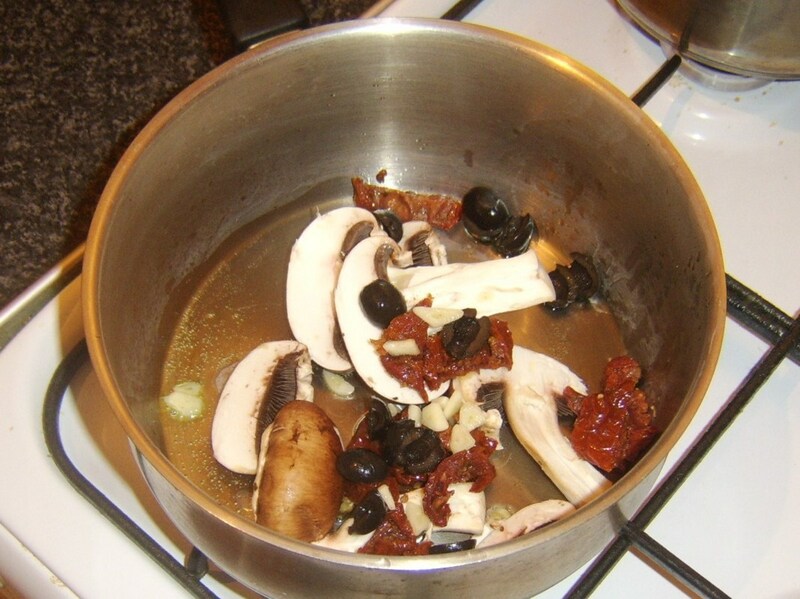 Pour about a tablespoon or so of olive oil in to a pot and bring it up to a medium heat. 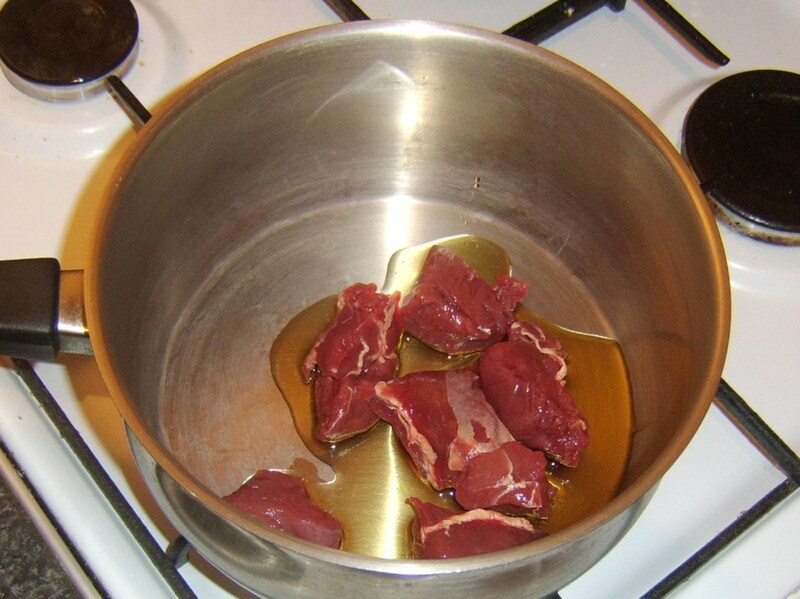 Add the venison and season with salt and pepper. 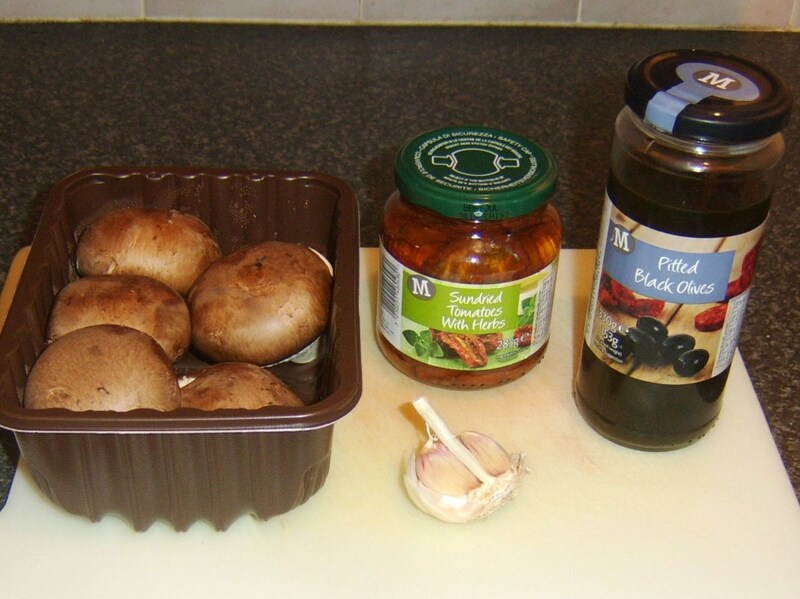 Carefully seal and brown, stirring all the time with a wooden spoon. 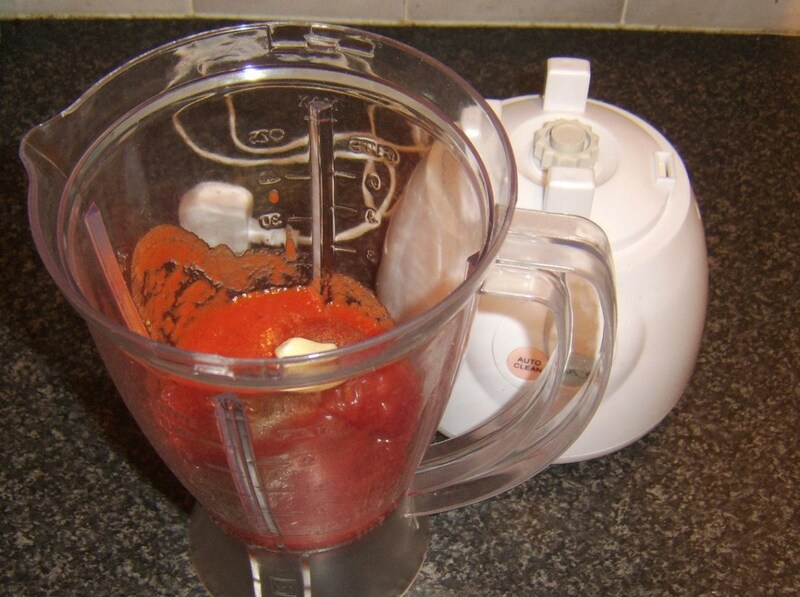 This should take two or three minutes. 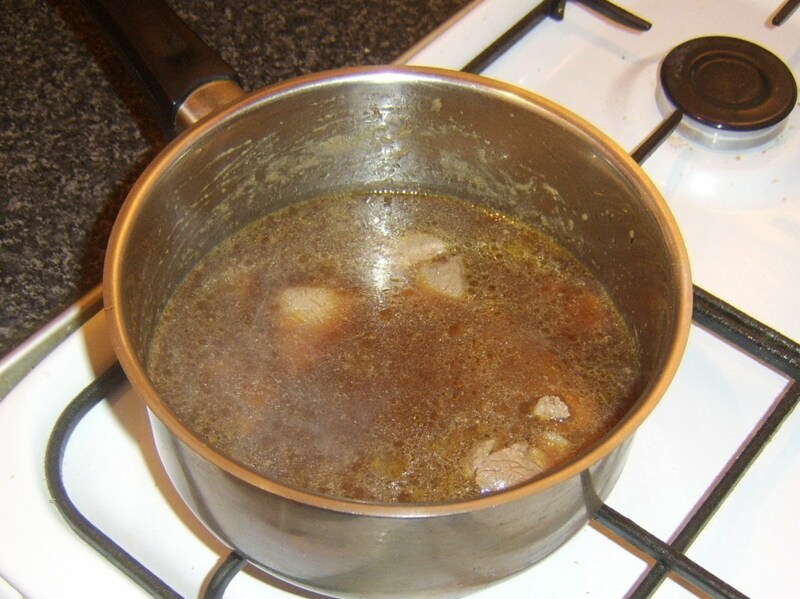 Pour in the beef stock and bring to a simmer. 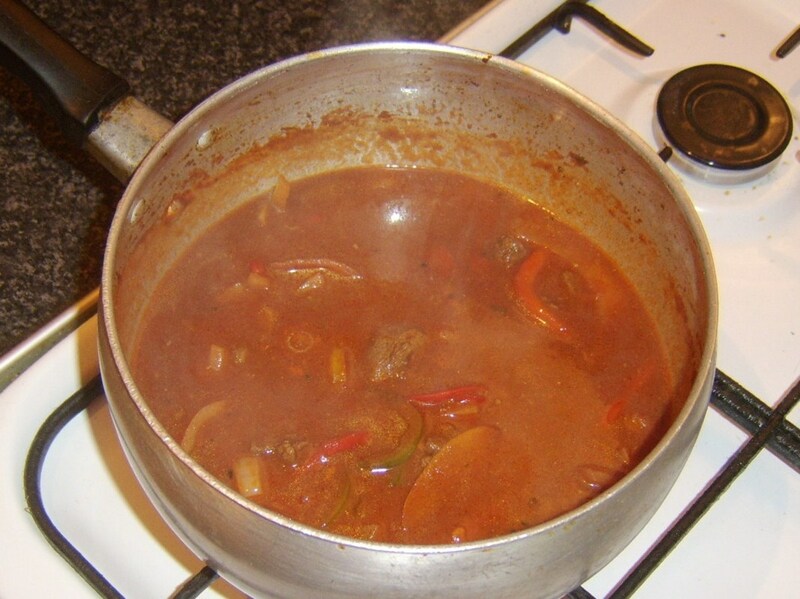 Cover and continue to simmer for two hours or until the venison is tender. 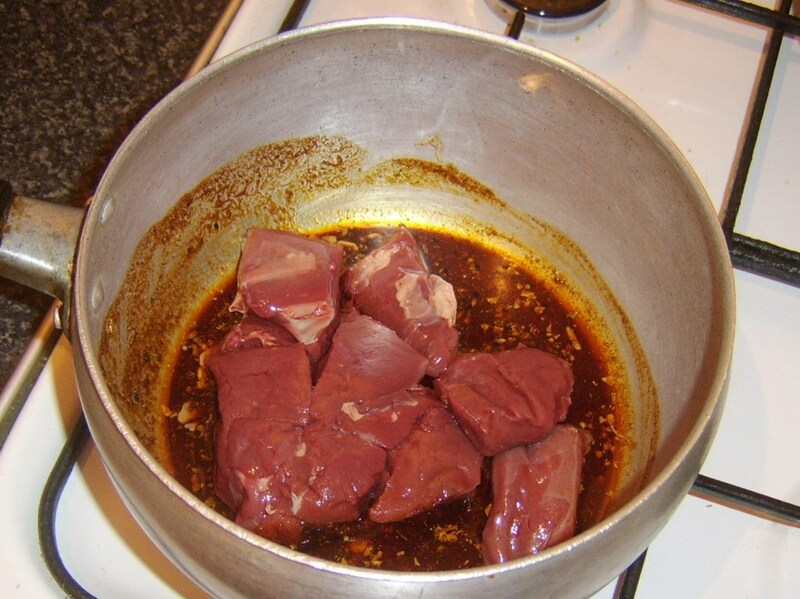 When the venison has been simmering for about an hour and a half, start your oven preheating to 400F/200C. 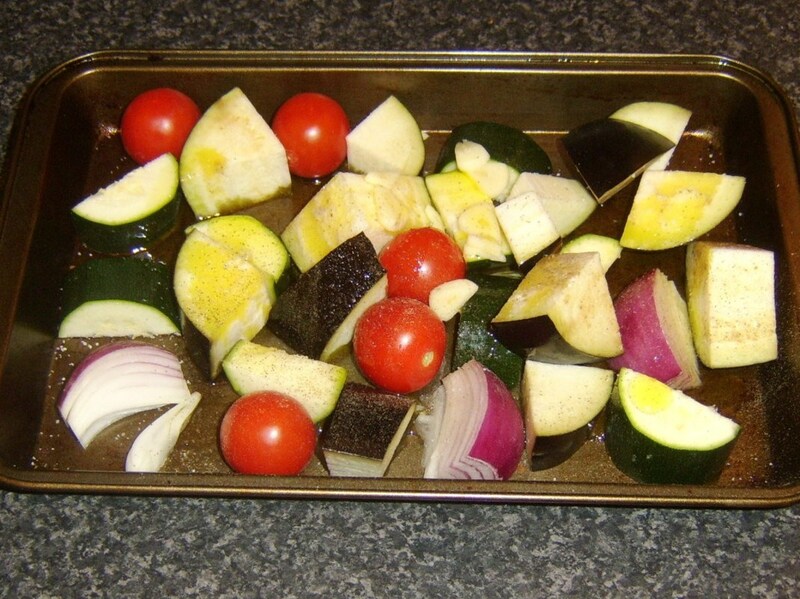 Put all the vegetables in to a deep roasting tray and drizzle liberally with olive oil. 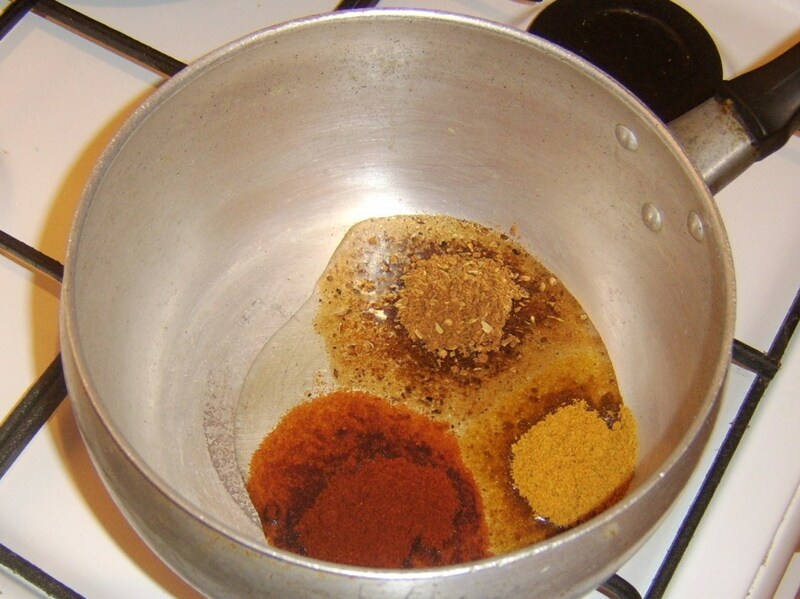 Season with salt and pepper and carefully stir. 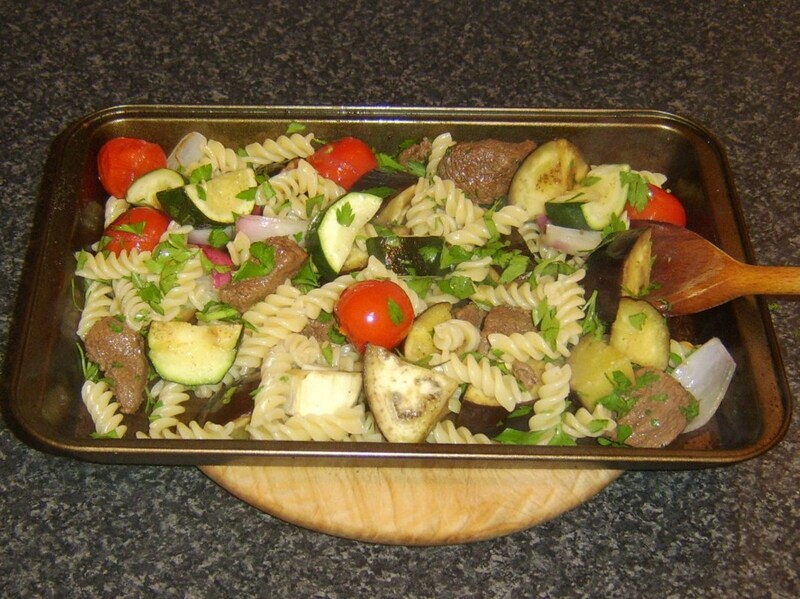 Roast in the oven for twenty minutes. 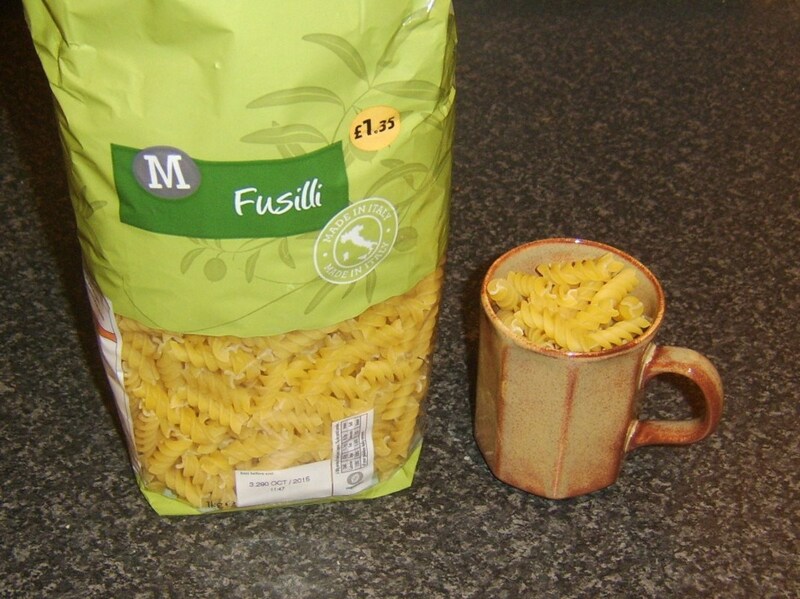 The fusilli should be added to a deep pot of heavily salted, simmering water to cook for around ten minutes. 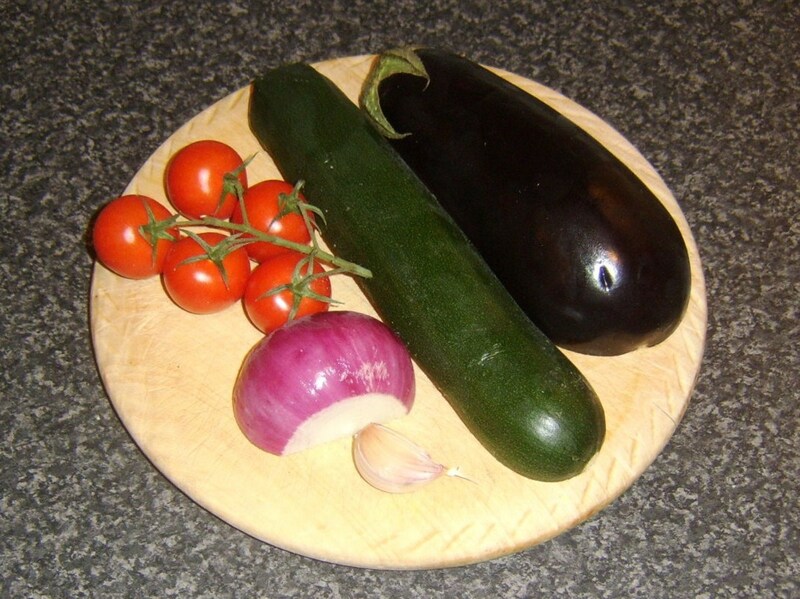 It should then be drained through a colander. 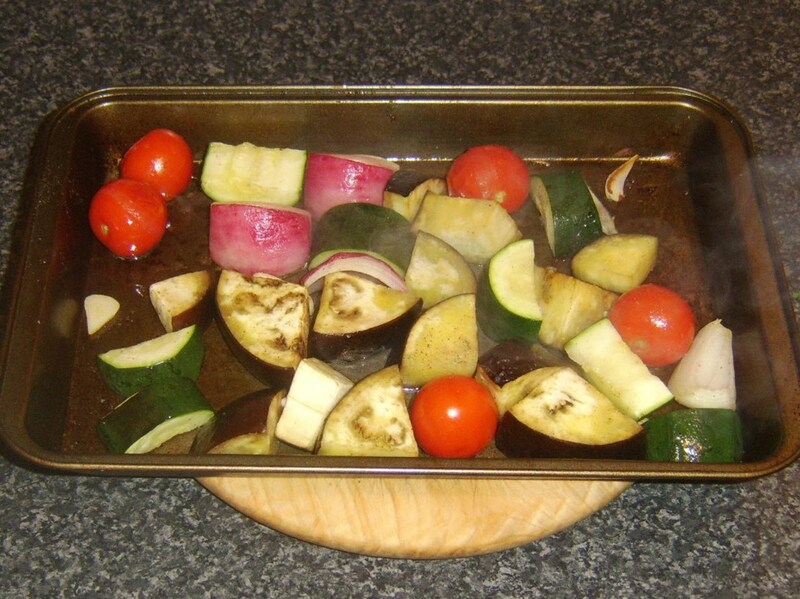 The tray of vegetables should be taken from the oven and laid on a heatproof surface such as a wooden shopping board. 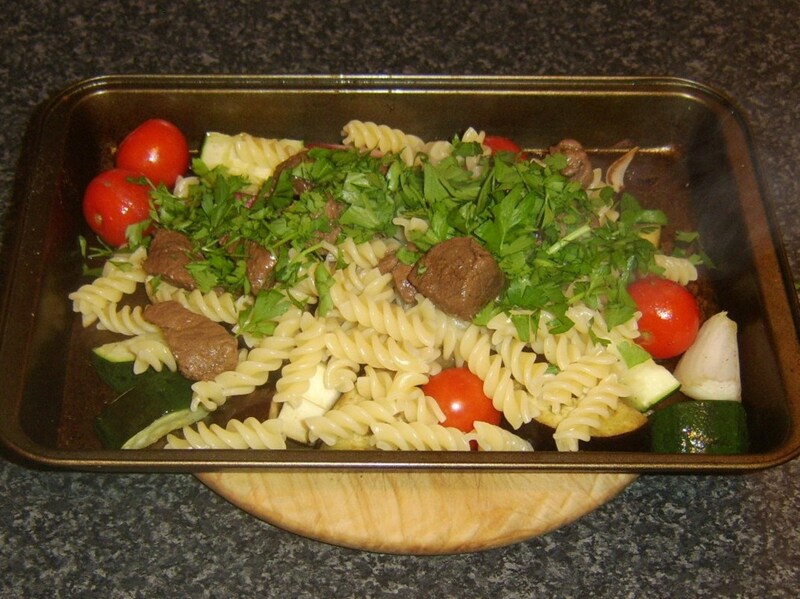 The pasta, chopped parsley and venison (lifted from the gravy with a slotted spoon) should be added to the tray. 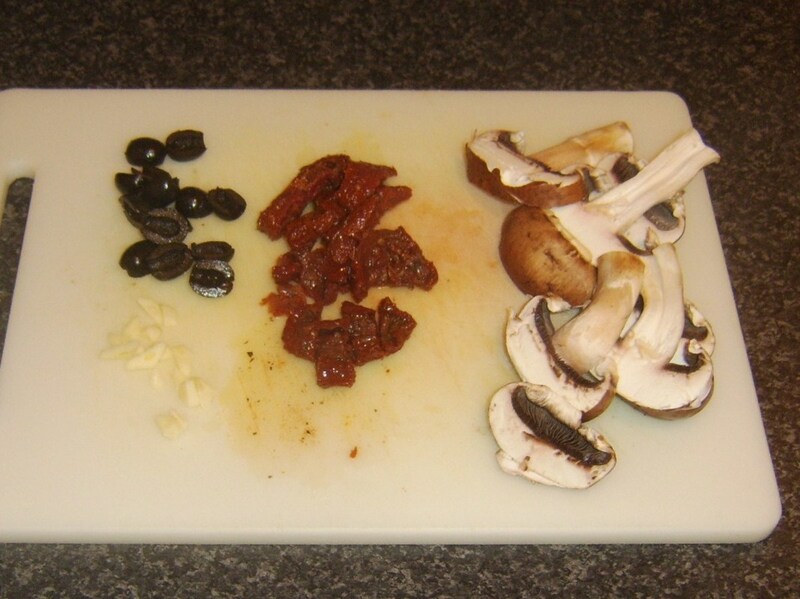 Carefully mix together before plating to serve. 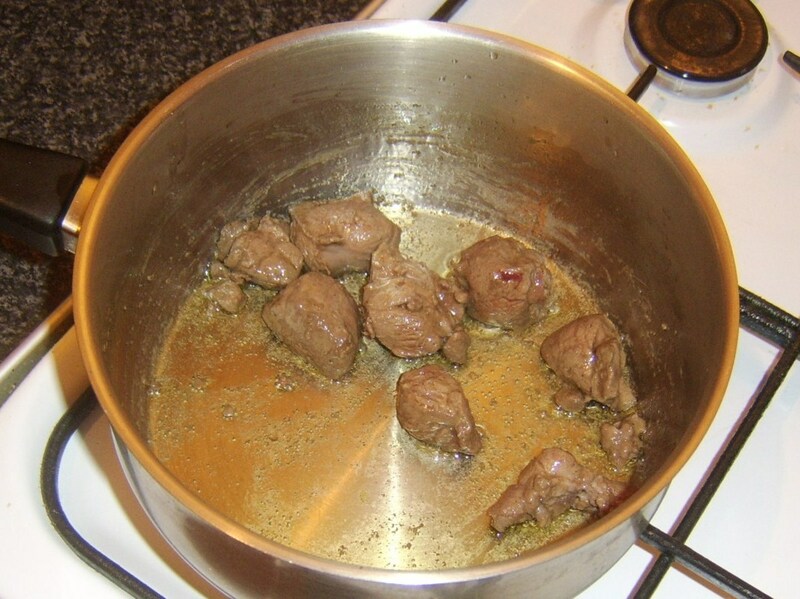 The venison is seasoned and browned in a little olive oil. 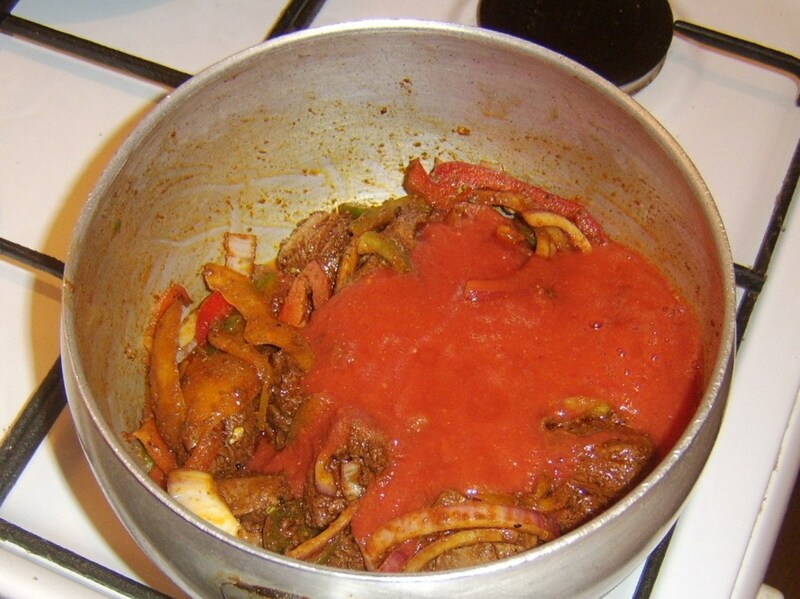 The tomatoes are blended with the oregano, the garlic clove and salt and pepper to form a smooth sauce. 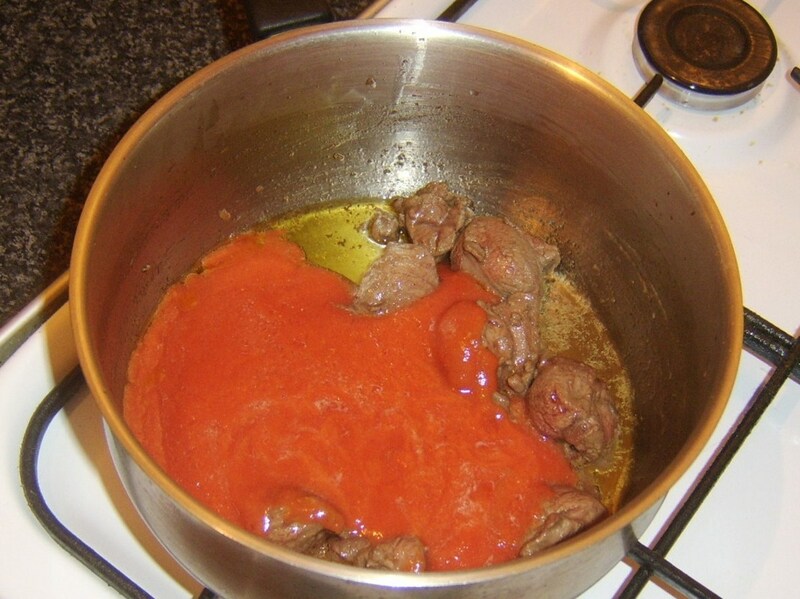 The tomato sauce is added to the venison along with the beef stock. 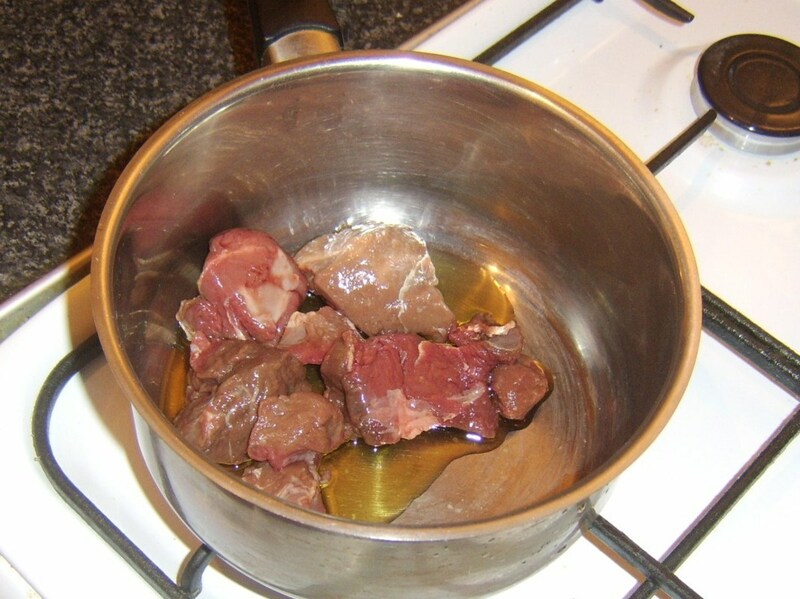 The combination is brought to a gentle simmer for a couple of hours until the venison is tender. 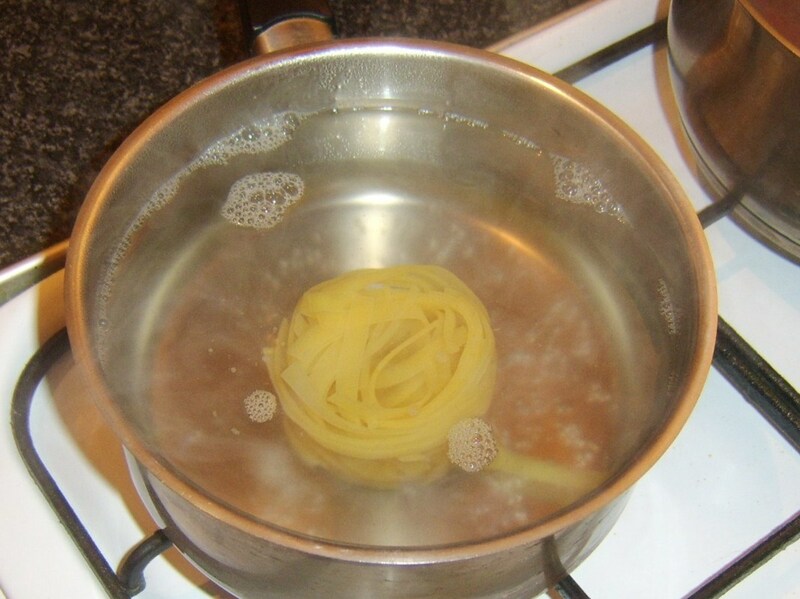 The tagliatelle nest is added to heavily salted boiling water for ten minutes' simmering before being drained. 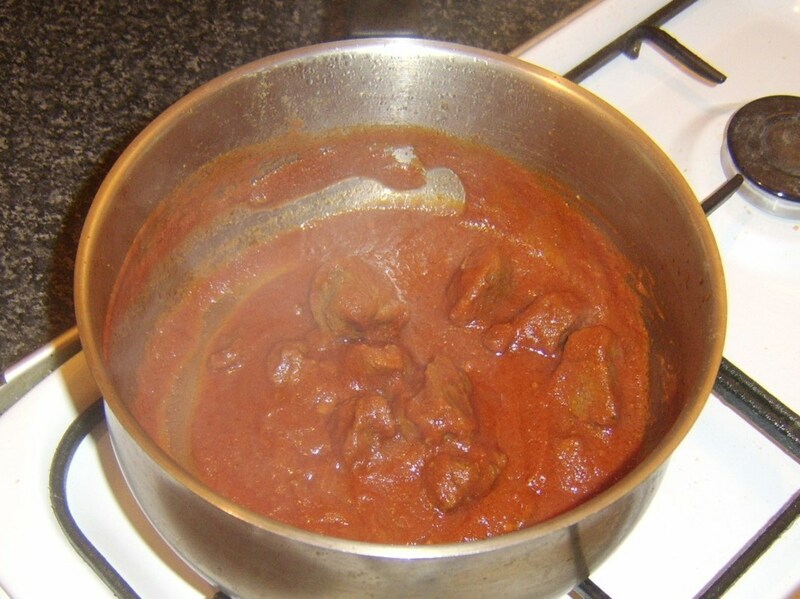 It is then carefully stirred through the sauce. 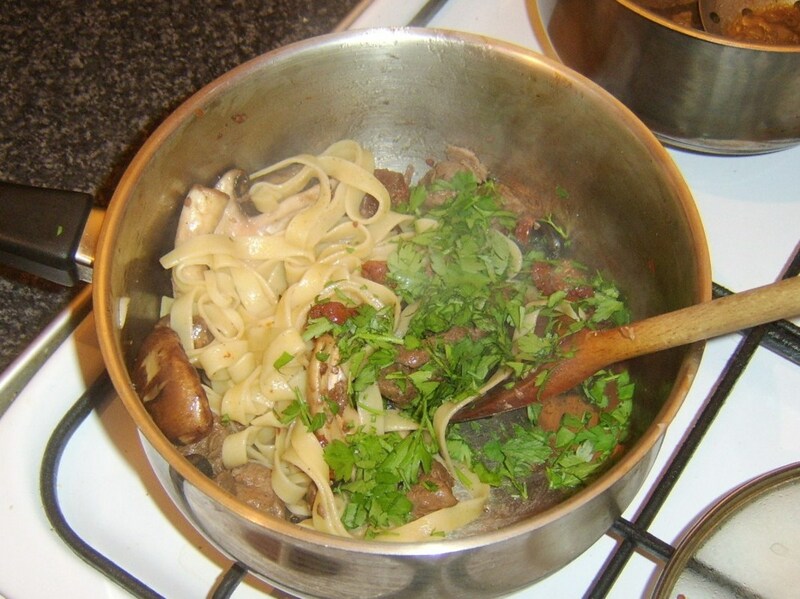 The pasta and sauce are plated before being garnished with the chopped parsley. 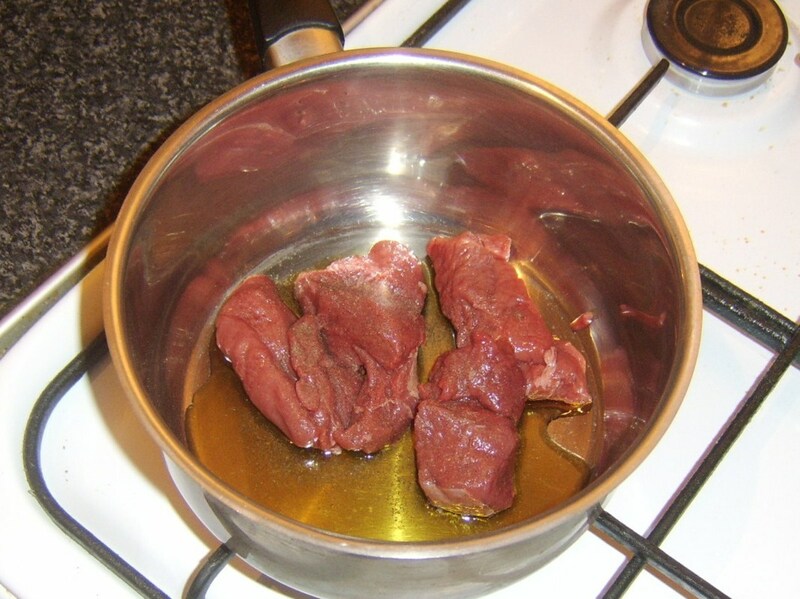 The venison meat is as before browned in olive oil, seasoned and simmered in the beef stock for a couple of hours until tender. 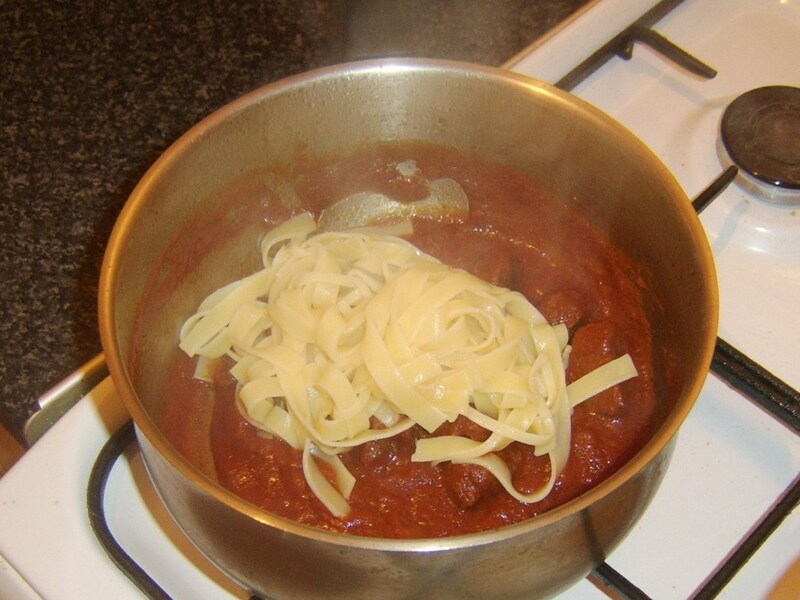 The tagliatelle goes in to a big pot of heavily salted water to simmer for ten minutes until just al dente. 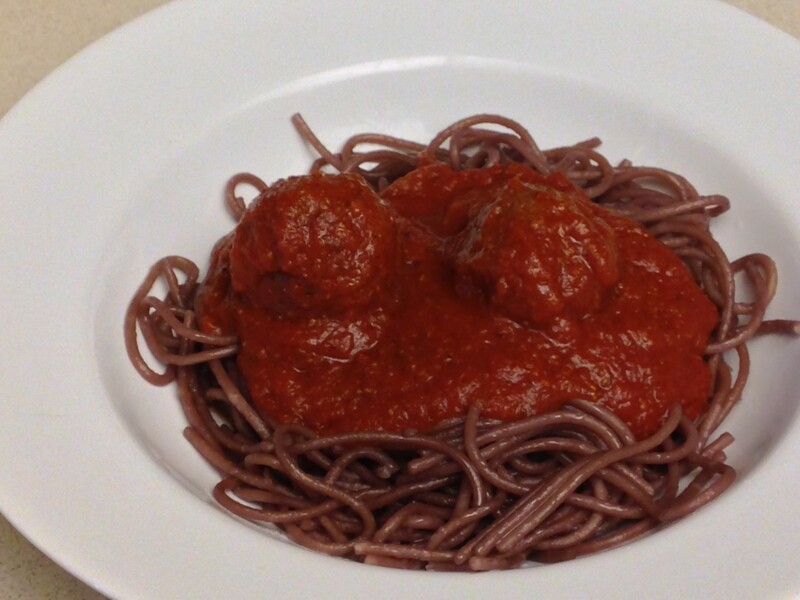 It is then drained through a colander. 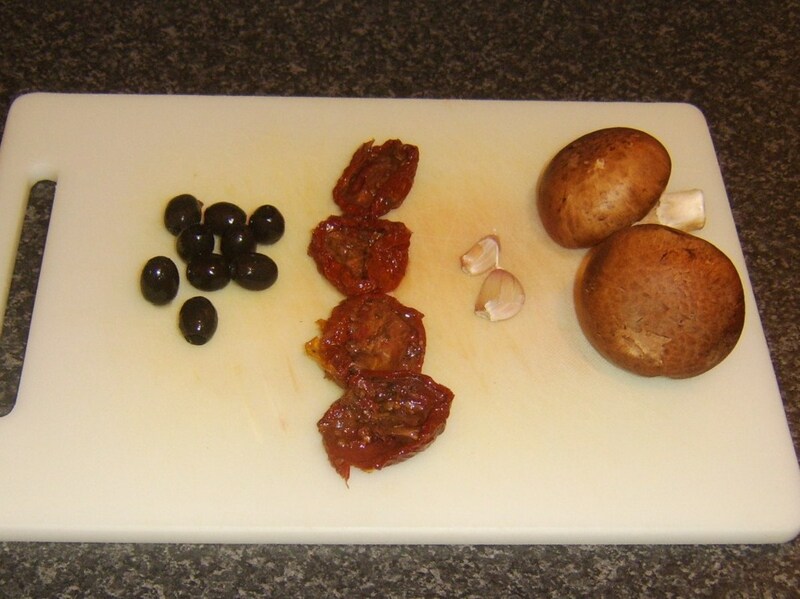 The sun dried tomatoes, mushrooms, garlic and olives should be added to a pot with a little warmed olive oil to sautee for a couple of minutes. 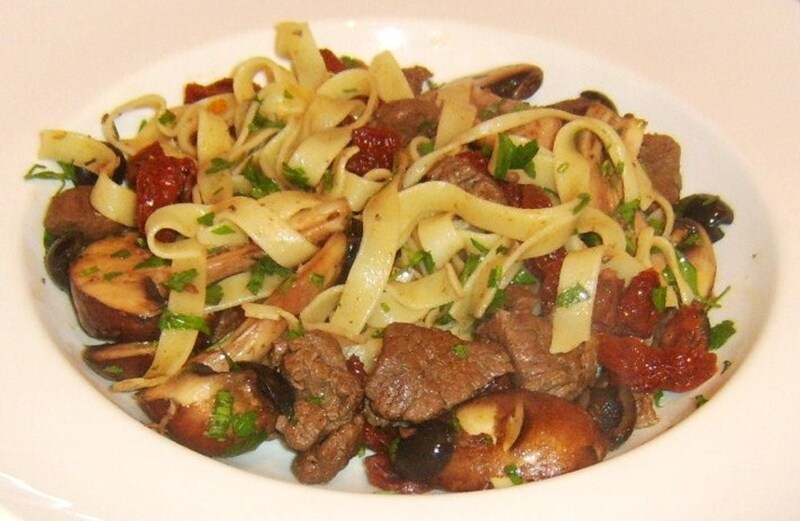 The drained pasta, drained venison and parsley are then added and carefully stirred though before the whole combination is plated and served. 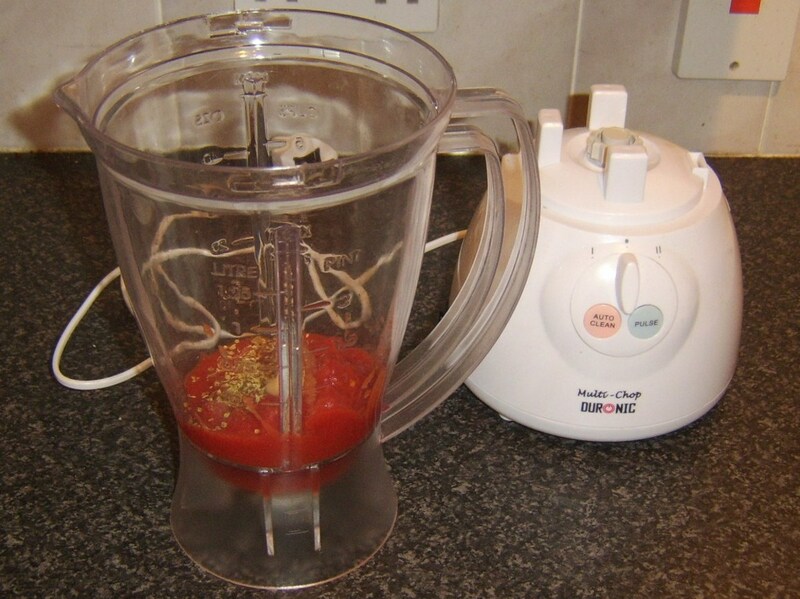 Put the tomatoes and garlic clove in to your blender/liquidiser and blitz until smooth. 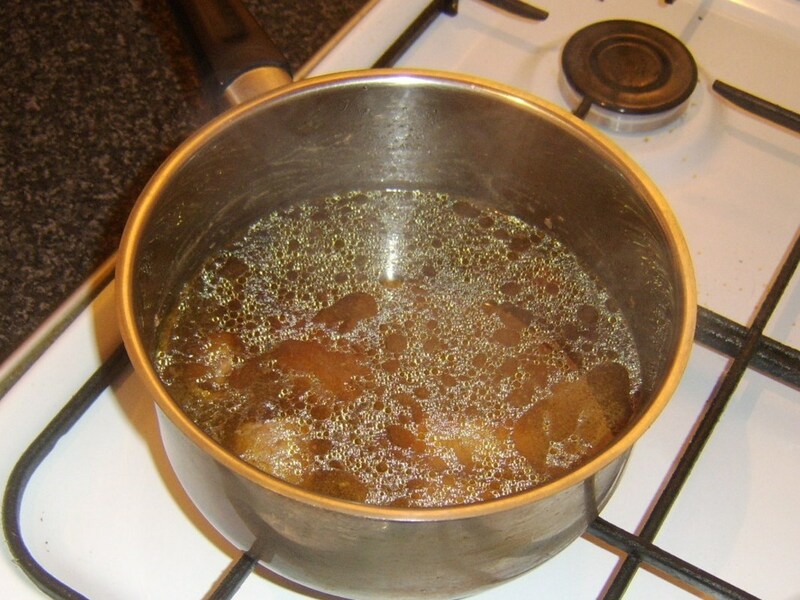 Pour the vegetable oil in to a large pot and add the spices. 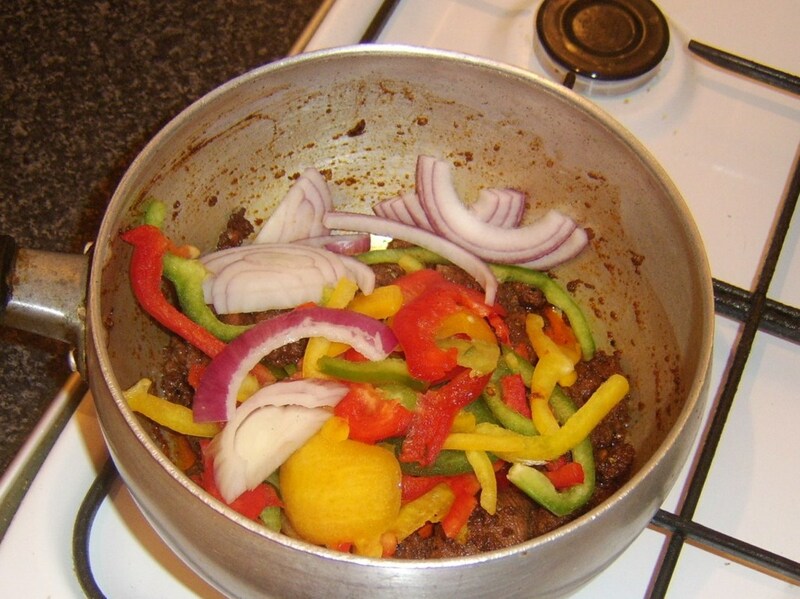 Stir fry gently for a couple of minutes to cook off the spices before adding the vension to brown and seasoning with salt and pepper. 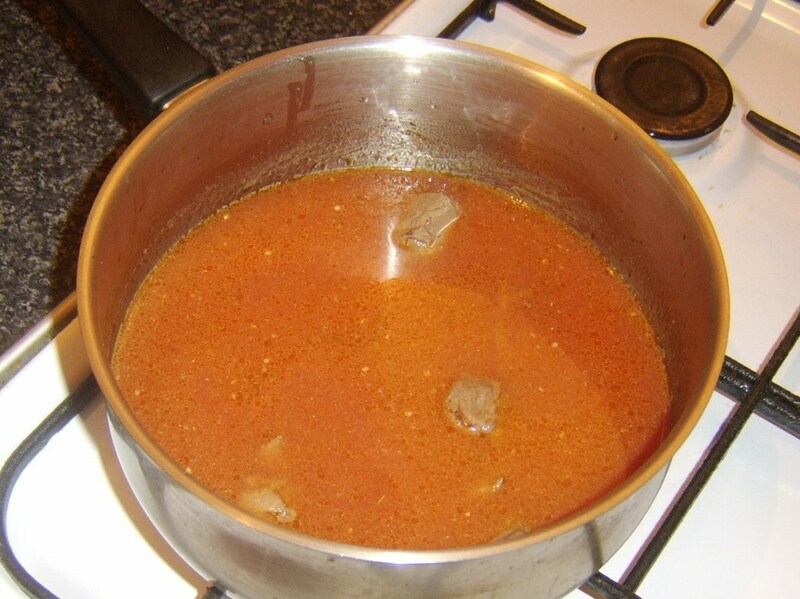 Pour the pureed tomatoes and stock in to the pot and bring to a gentle simmer for a couple of hours until the venison is tender. 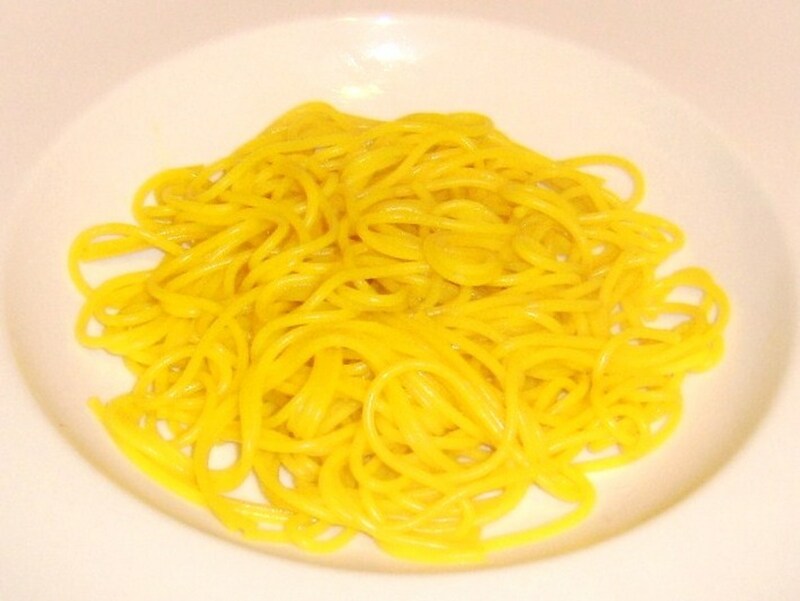 Add the turmeric to a large pot of heavily salted water along with the apaghetti. 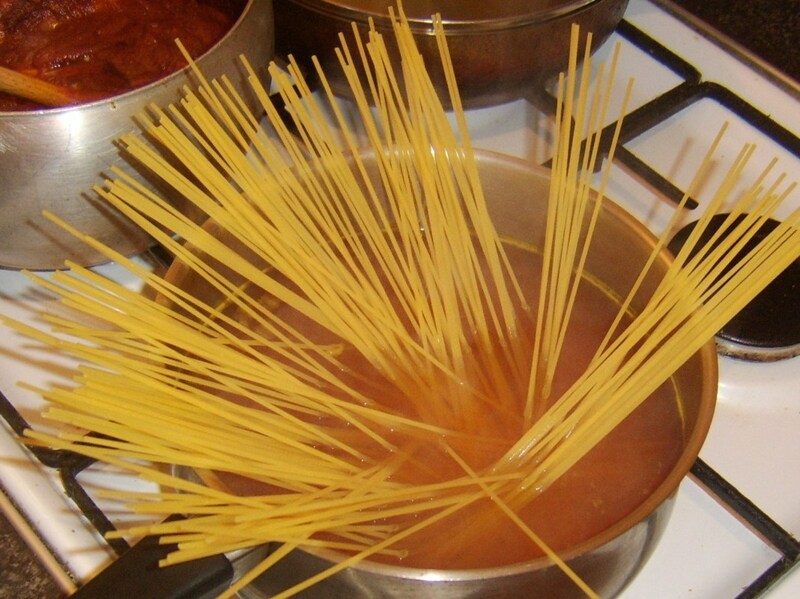 Cook for about ten minutes until the pasta is al dente. 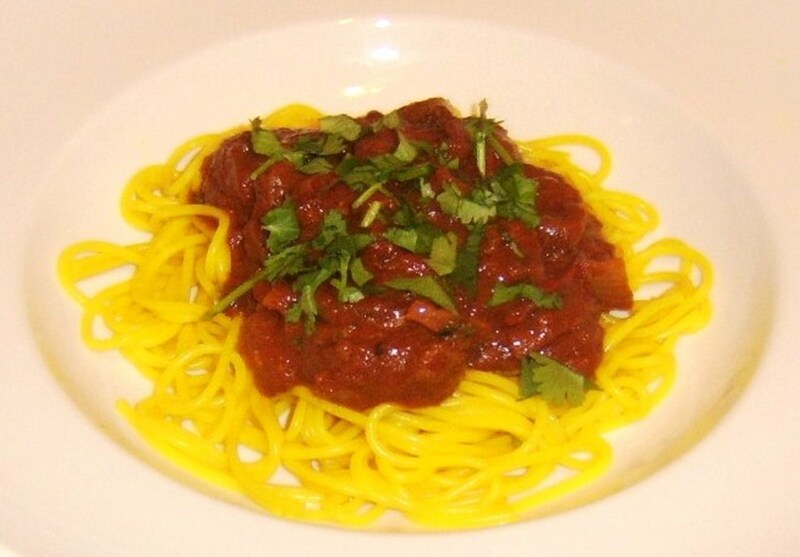 Drain the spaghetti and arrange in bed form on plates. 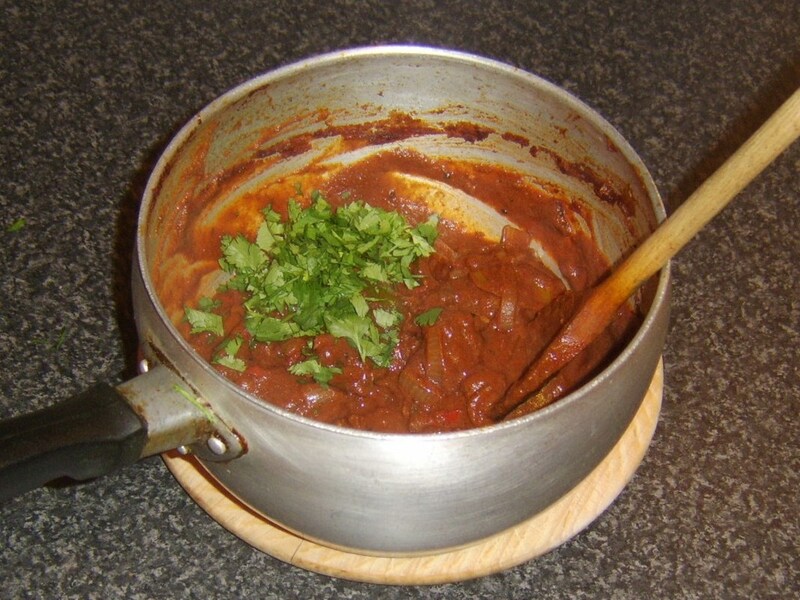 Stir the tablespoon of coriander/cilantro through the venison curry before spooning on to the spaghetti and garnishing with the remaining herb. I hope you enjoy whatever you try, Cjarosz - thanks for visiting. This is great! 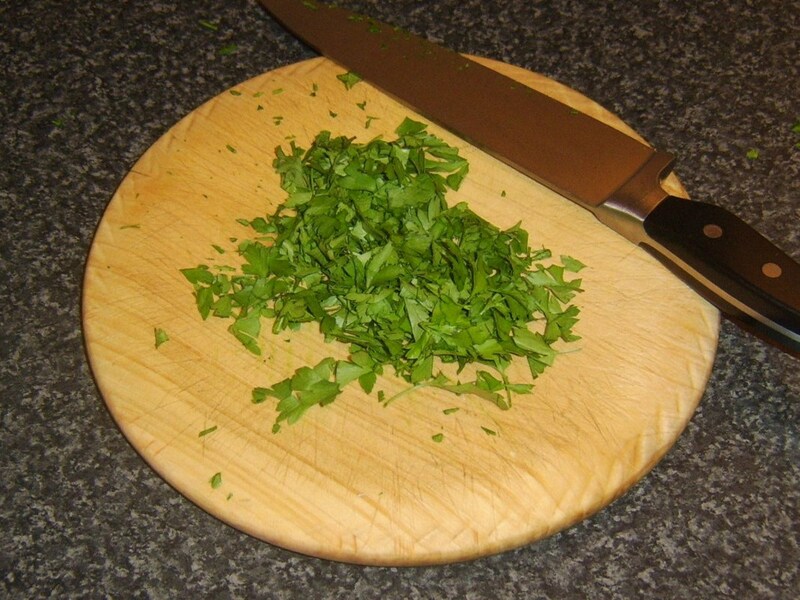 My husband is a hunter and I am tired of using his family's recipes. 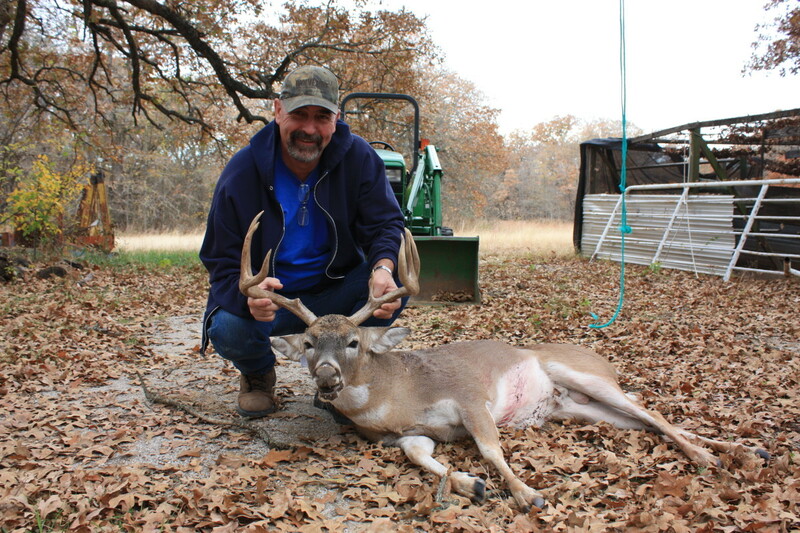 We have a buck and doe coming in tomorrow when he arrives home, so I will be using one of these. I will update. Thanks so much. 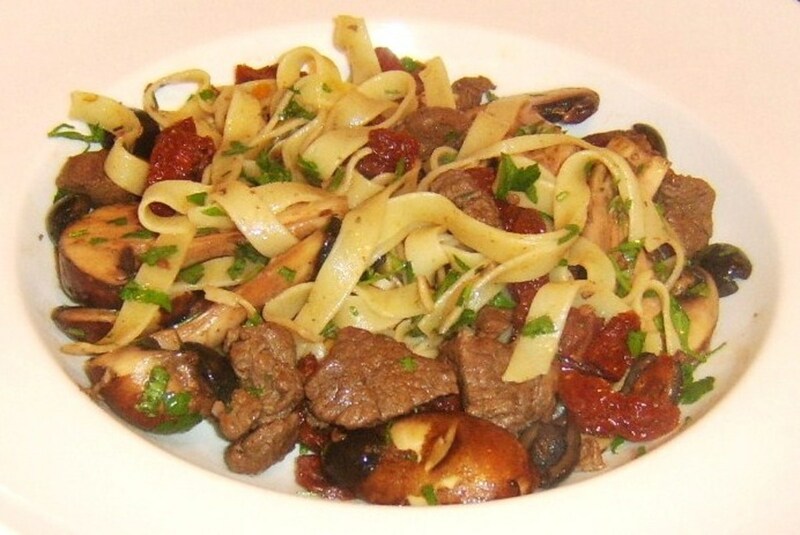 You're right that venison is not the most popular pairing for pasta, but there is no reason not to give it a try. I hope that I can sometime. 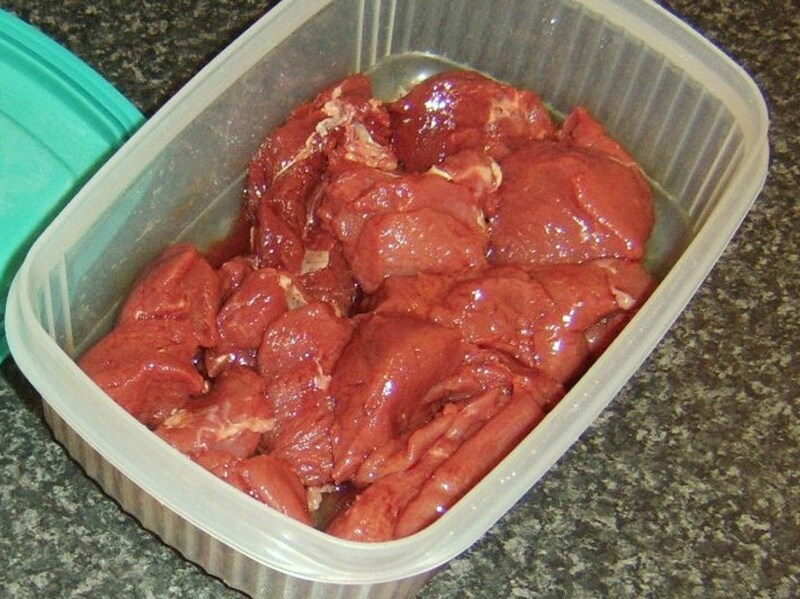 Ive heard of Venison but Ive never had it before. 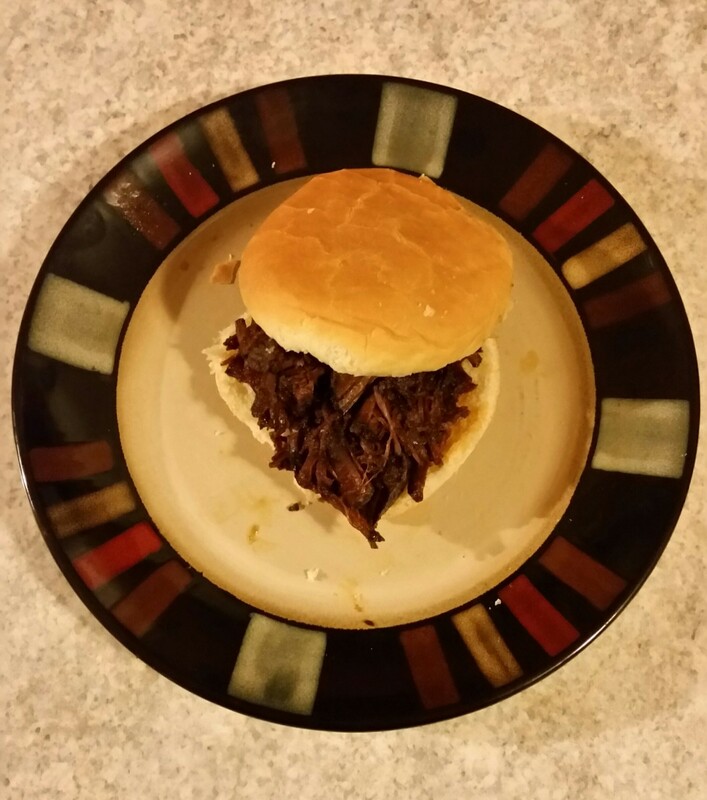 Thanks for the recipe and tips. Voted up. 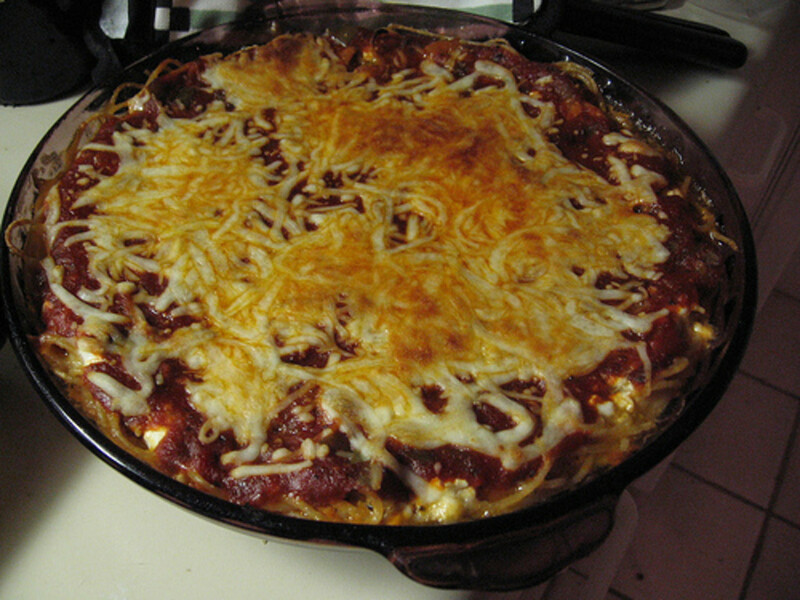 Wow!, very yummy recipes...thanks for sharing. Thank you peachpurple. 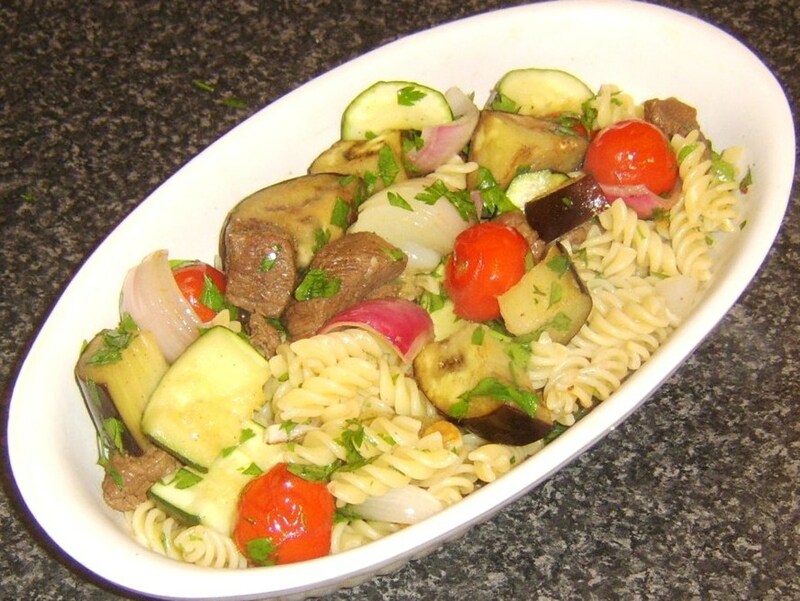 I think meat is often under-rated as a pasta accompaniment and I love experimenting with its inclusion. Hope you enjoy these ideas.